Grandma left her purse on the bench! From her purse, there are cell phone, paintbrush, envelope and keys falling and you’ll see the frog, mouse, and other creatures have taken over. But this is just one of the cool things you’ll find right around the fountains at the Waterway Square. 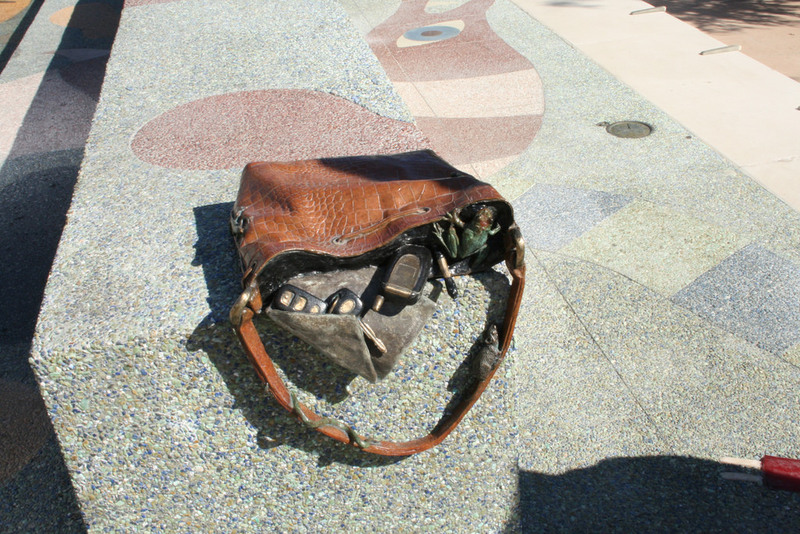 The purse is cast bronze and is normal-sized. 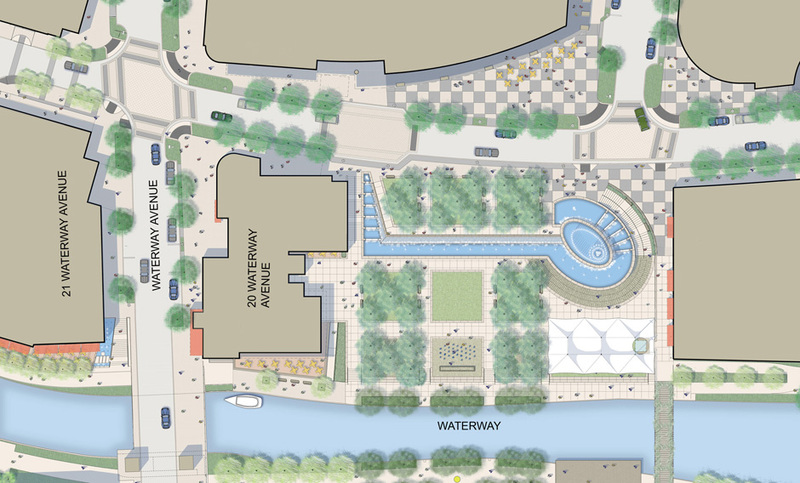 There are 20 cast glass objects, 20 bronze objects, and 100 water-jet cut tiles found in the Waterway Square. The Brilliant color of the rustic tiles is achieved with the use of exotic mineral aggregates such as turquoise and Lapis Lazuli in addition to the more traditional aggregates of marble and granite. From the surrounding buildings and from the air, the water wall and fountain looks like an eighth note. The water cascades down seven terraced levels and down a stone wall to the lower pond stretching 120 feet long. There are a total of 22 cascade jets, 20 in the lower pond and 2 at the top of the upper fountain. Enjoy watching the fountains programmed to perform to the music of “The Rainbow Connection” by Kermit the Frog, “Louie, Louie” by The Kingsmen, “Texas Medley” and “Proud to be an American” by Lee Greenwood. 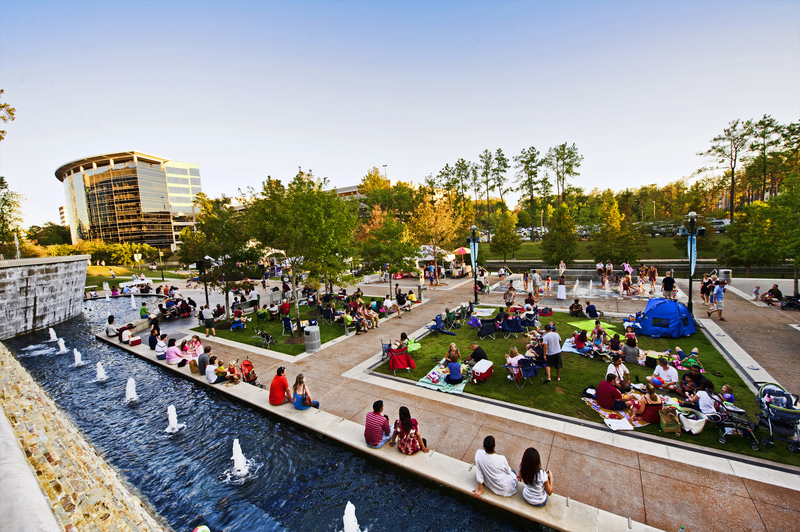 Whether having a picnic with your family or going out on a stroll, don’t miss the experience of seeing the fountains choreographed to music and colored lighting at night at the Waterway Square in The Woodlands.